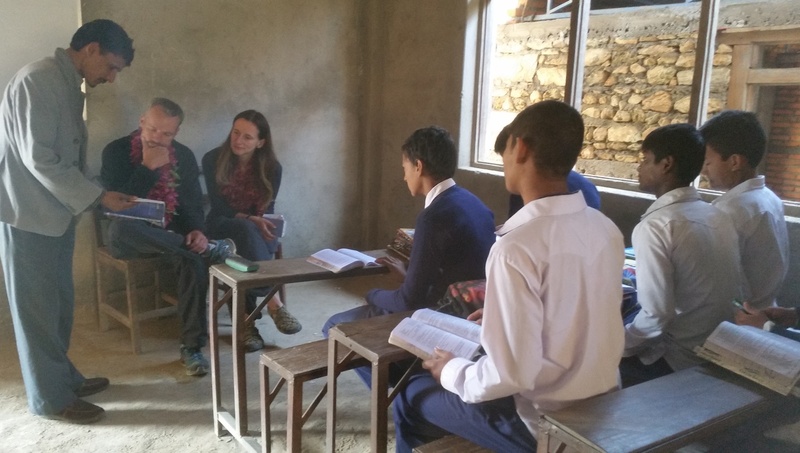 Details for Volunteering in Rural Village School in Gorkha. Gorkha is situated 150 Km far from the Capital city of Kathmandu. There are easy access of roadways to reach the main city of Gorkha, but our volunteering area, Bungkot is 17 KM far from the city & gravel road links to the village with jeep or buses. Rameshwory Secondary School. Bungkot -09, Gorkha. School main buildings has collapsed due to the earthquake of 25th April, 2015.
just 10 minutes walking distance from the our Pioneer Volunteer’s Home Stay. only temporary rooms are available for the students tuitions. All teaching methods are in Nepalese Medium, except English Book. You have to sign up for minimum of one week to 10 days volunteering teaching. But if you could do more days for volunteering in School, it would always be perfect. You could sign up for 2 weeks, 3 weeks, 1 month or more volunteering teaching in this school, but you have to confirm your timeline of volunteering beforehand. On your volunteering program, lodging will be at our “Pioneer Foundation-Volunteer Home Stay” . So it is an experience to live together with families, which gives you antique opportunity to enjoy, explore and interact with the local peoples, their lifestyles and culture. You will get one double/Twin Bedded or Tripple bed room for your staying in volunteering and toilets are outside in the yard. Shower will be cold at outside in bathroom yard. You could buy water heating rod (it is available in Kathmandu or in Gorkha and take it with you for hot bucket shower). We will also provide you hot water in the Bucket upon your request. You will have basic food. As it is village, you would not have much choice of western food (But you could buy some noodles, spaghetti, cheese etc. and take it with you). Nepali Food (Dal Bhat) - which is combine with plain rice, lentil soup, potato’s curry/cauliflower curry, Gundrek Sadeko (Kimchi) or pickle etc. Milking cow/buffalo, visit to rice field, fishing in pond, visit to cultural villages, historical areas such as Martyr Bhimsen Place or Budi - Gandaki Sattle (Old temple at riverbank of Gandaki River etc.). Or day hiking in other villages etc., with local guides. Also available other schools for the volunteering near by this home stay. Ramche School, 25 minutes & Dahale Primary school, 30 minutes in walking distance.